In the nervous system, a synapse is a structure that permits a neuron (or nerve cell) to pass an electrical or chemical signal to another neuron or to the target effector cell. Santiago Ramón y Cajal proposed that neurons are not continuous throughout the body, yet still communicate with each other, an idea known as the neuron doctrine. The word "synapse" – from the Greek synapsis (συνάψις), meaning "conjunction", in turn from συνάπτεὶν (συν ("together") and ἅπτειν ("to fasten")) – was introduced in 1897 by the English neurophysiologist Charles Sherrington in Michael Foster's Textbook of Physiology. Sherrington struggled to find a good term that emphasized a union between two separate elements, and the actual term "synapse" was suggested by the English classical scholar Arthur Woollgar Verrall, a friend of Foster. Some authors generalize the concept of the synapse to include the communication from a neuron to any other cell type, such as to a motor cell, although such non-neuronal contacts may be referred to as junctions (a historically older term). It is widely accepted that the synapse plays a role in the formation of memory. 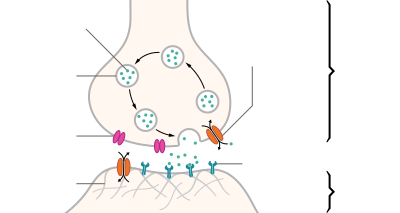 As neurotransmitters activate receptors across the synaptic cleft, the connection between the two neurons is strengthened when both neurons are active at the same time, as a result of the receptor's signaling mechanisms. The strength of two connected neural pathways is thought to result in the storage of information, resulting in memory. 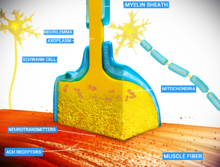 This process of synaptic strengthening is known as long-term potentiation. ^ a b Foster, M.; Sherrington, C.S. (1897). Textbook of Physiology, volume 3 (7th ed.). London: Macmillan. p. 929. ^ Elias, Lorin J.; Saucier, Deborah M. (2006). Neuropsychology: Clinical and Experimental Foundations. Boston: Pearson/Allyn & Bacon. ISBN 978-0-20534361-4. LCCN 2005051341. OCLC 61131869. ^ "synapse". Online Etymology Dictionary. Archived from the original on 2013-12-14. Retrieved 2013-10-01. ^ Tansey, E.M. (1997). "Not committing barbarisms: Sherrington and the synapse, 1897". Brain Research Bulletin. Amsterdam: Elsevier. 44 (3): 211–212. doi:10.1016/S0361-9230(97)00312-2. PMID 9323432. The word synapse first appeared in 1897, in the seventh edition of Michael Foster's Textbook of Physiology. ^ Schacter, Daniel L.; Gilbert, Daniel T.; Wegner, Daniel M. (2011). Psychology (2nd ed.). New York: Worth Publishers. p. 80. ISBN 978-1-4292-3719-2. LCCN 2010940234. OCLC 696604625. ^ Perea, G.; Navarrete, M.; Araque, A. (August 2009). "Tripartite synapses: astrocytes process and control synaptic information". Trends in Neurosciences. Cambridge, MA: Cell Press. 32 (8): 421–431. doi:10.1016/j.tins.2009.05.001. PMID 19615761. ^ Missler, M; Südhof, TC; Biederer, T (2012). "Synaptic cell adhesion". Cold Spring Harb Perspect Biol. 4: a005694. doi:10.1101/cshperspect.a005694. PMC 3312681. PMID 22278667. ^ Silverthorn, Dee Unglaub (2007). Human Physiology: An Integrated Approach. Illustration coordinator William C. Ober; illustrations by Claire W. Garrison; clinical consultant Andrew C. Silverthorn; contributions by Bruce R. Johnson (4th ed.). San Francisco: Pearson/Benjamin Cummings. p. 271. ISBN 978-0-8053-6851-2. LCCN 2005056517. OCLC 62742632. ^ Lynch, M. A. (January 1, 2004). "Long-Term Potentiation and Memory". Physiological Reviews. 84 (1): 87–136. doi:10.1152/physrev.00014.2003. PMID 14715912. ^ Krugers, Harm J.; Zhou, Ming; Joëls, Marian; Kindt, Merel (October 11, 2011). "Regulation of Excitatory Synapses and Fearful Memories by Stress Hormones". Frontiers in Behavioral Neuroscience. Switzerland: Frontiers Media SA. 5: 62. doi:10.3389/fnbeh.2011.00062. PMC 3190121. PMID 22013419. ^ Stanley, EF (1992). "The calyx-type synapse of the chick ciliary ganglion as a model of fast cholinergic transmission". Canadian Journal of Physiology and Pharmacology. 70 Suppl: S73–7. doi:10.1139/y92-246. PMID 1338300. ^ Arimura, Nariko; Kaibuchi, Kozo (December 22, 2005). "Key regulators in neuronal polarity". Neuron. Cambridge, MA: Cell Press. 48 (6): 881–884. doi:10.1016/j.neuron.2005.11.007. PMID 16364893. ^ a b Kimata, Tsubasa; Tanizawa, Yoshinori; Can, Yoko; et al. (June 1, 2012). "Synaptic Polarity Depends on Phosphatidylinositol Signaling Regulated by myo-Inositol Monophosphatase in Caenorhabditis elegans". Genetics. Bethesda, MD: Genetics Society of America. 191 (2): 509–521. doi:10.1534/genetics.111.137844. PMC 3374314. PMID 22446320. ^ Tanizawa, Yoshinori; Kuhara, Atsushi; Inada, Hitoshi; et al. (December 1, 2006). "Inositol monophosphatase regulates localization of synaptic components and behavior in the mature nervous system of C. elegans". Genes & Development. Cold Spring Harbor, NY: Cold Spring Harbor Laboratory Press. 20 (23): 3296–3310. doi:10.1101/gad.1497806. PMC 1686606. PMID 17158747.